Marine worms are one of the most abundant forms of life in the ocean. Their abundance is due to their adaptability. Starting with a basic body plan, evolution has shaped many different species to occupy many niches, both aquatic and terrestrial. Worms from the Class Polycheata (or “many spines”) alone make up over 8000 described species. One Family of polychaete worms, the Amphinomidae have spines, called setae, that have evolved to contain venom as a form of defense. These are often aptly referred to as “fireworms” because their spines break off easily and penetrate the skin of an attacker, which results in a sensation that “burns like fire.” Another term sometimes used is “bristleworm,” but this is a general term referring to all polychaetes. I will restrict the usage of the term “Fireworms” to those belonging to the genera Hermodice, Eurythoe, Chloeia, and Amphinome. Although these animals have a bad reputation with aquarists, especially reef- tankowners, they are actually extremely amazing creatures. But this hardly quells the concerns of reef-tank owners who are unlucky enough to have them show up in their aquarium. I use the term “unlucky” because it really is a case of luck that one would appear in a tank. While the chances are very good for other species of polychaetes to arrive as epibionts on live-rock, true fireworms are a rare find. Most cases of “fireworms” being found in aquaria are actually some other kind of polychaete, which in most cases may be benign or even beneficial. Since most people are only concerned with getting rid of them, there is not much information on how to keep them. I think the overall attitude about them would change if people kept them long enough (in a separate tank of course) to get to know them. I will give a brief background on them and describe their husbandry requirements for people who would actually like to keep them around. Fig. 1. A twelve inch Fireworm, Hermodice carunculata, foraging for food. Bristles are not flared. Fireworms, especially Hermodice carunculata and Eurythoe complanata, can be found throughout the Gulf of Mexico, Bahamas, and the Caribbean. H. carunculata is a predatory species feeding on almost any sessile animal it can catch, but having distinct preferences if given an option. In particular they feed on corals, hydrocorals, gorgonians, and anemones (Is it any surprise that reef-tank owners detest them?). They also have preferences of species within those groups. The effects of predation on certain groups can be substantial. Witman (1988) calculated that tissue predation by this worm on Milleporid Hydrocorals (firecoral) exposed 12.9cm2 per 1.0m2 per day of skeleton to algal colonization. Another favorite food item of H. carunculata is the Atlantic Carpet anemone, Stoichactis helianthis. This anemone has developed a defensive behavior just for dealing with a fireworm attack. Lizama and Blanquet (1975) described this behavior after watching H. carunculata attack numerous anemones. Fireworms feed by everting their buccal mass, a muscular area comprising the pharynx and esophagus, over a portion of the anemone. Rippling muscles and secreted enzymes serve to breakdown the material and ingest it. The anemone reacts upon contact with the buccal mass by detaching its pedal disk from the substrate that it was anchored to. Wave action from the environment causes the anemone to toss about in the water, eventually dislodging it from the grasp of the fireworm. Yet another favorite food of H. carunculata is gorgonian tissue. In an effort to estimate the effects on gorgonian community structure due to predation by H. carunculata, Vreeland and Lasker (1989) performed an experiment to determine preferences that this fireworm had for various species. Gorgonians have various types, sizes, and densities of Sclerites (CaCO3 spicules) that Harvell and Suchanek (1987) suggest deter predation. Lack of nutritive value and secondary chemical compounds that may be distasteful, toxic, or inhibit digestion (Tursch et al., 1978) were also suggested as predator deterrents (Ciereszko and Karns, 1973). These three factors were analyzed and compared by Vreeland and Lasker (1989) to the preferences that H. carunculata had for the various species. What they found is that there was no single factor could be used to predict preference. However, it is interesting to note that some species with the highest level of secondary compounds were sometimes thepreferred prey item. The authors suggest that the worms may sequester these toxins in their body as a source of protection in addition to their venomous setae. Most soft-bodied worms must remain nocturnal, or buried in sediment, or under rocks during the day in order to avoid predators. H. carunculata, however, is able to be conspicuous by moving about during the day in search of food. This is due to the protection they receive from their venomous setae and possibly sequestered gorgonian toxins. Although Marsden (1962) claimed that this animal never appeared in the middle of the day and could only be seen after 4:00pm or before 9:00a.m, a more intensive survey by Lewis and Crooks (1996) found them out at all times during the day, with the highest abundance visible at about 4:00pm. There appeared to be a cycle to the foraging activity, starting off slow in the morning, getting more intense towards the afternoon, then diminishing again as dusk settled. The unusual daytime activity along with their large size, conspicuous tufts of bristles, and beautiful colors is what made them a good candidate for public display. 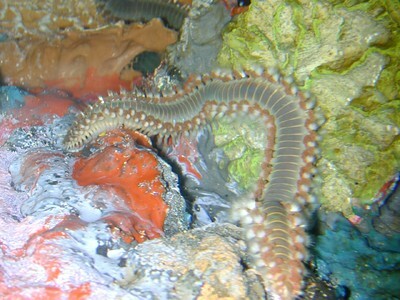 In April 2001, I set up a 100-gallon display tank at Mote Marine Aquarium solely for fireworms. To my knowledge, this is the only fireworm display in the world. It is a 4’tall by 2 ½’ wide half-cylinder tank with an artificial coral wall, which extends up the entire back, that was constructed by the aquarium staff especially for these animals. The preferred habitat of fireworms is rocky areas. The wall was made to create small crevices to give the worms a sense of security without allowing them to be completely hidden from view. Extra care was taken when building the fiberglass wall not to leave any open holes where worms could crawl into and hide. Two species of fireworm are present in the tank. They are H. carunculata and E.complanata. Even with all the care taken to patch the small holes in the rockwork, E. complanata was able to find some VERY tiny holes we overlooked and are rarely visible. This species is a scavenger that, like most otherworms, spends the daytime hiding, emerging at night to feed. For these reasons, I don’t suggest using this species in a situation where you expect them to be seen. H. carunculata, on the other hand has worked out quite well. The lighting on the display is dim compared to most of the others. While there is only about eighteen watts of light on the four-foot deep tank, the worms are still very visible. When the display was originally opened, I had set a timer for the lights to come on earlier than the other display lights, but still mimic a natural twelve hour cycle. This was to try and induce their 4:00pm peak activity to occur during our busiest visitor hours to the aquarium, which actually occurs earlier in the day. Although Marsden (1962) found that these animals retained this pattern of activity in the laboratory, we did not find this to be true with our animals. The only stimulus that we found to be reliable for inducing activity was introducing food to the tank. Although H. carunculata prefers the tissue of Cnidarians, it will readily accept and thrive on alternative foods in captivity. These include: squid, clam, shrimp, krill, mysid shrimp, mussel, etc. Our worms are fed once daily and seem to grow at an appreciable rate. They would probably accept more feedings and grow faster if given the opportunity. Even with our reserved feeding schedule, our worms obtain a length of fourteen inches, which is a size that is two inches longer than what the literature cites as being the maximum. Please note that the worms are capable of stretching out a great deal when crawling. I do not know what the standard method for measuring them is, but I measured them while in a resting position. Fig. 2. Another color variation of Hermodice carunculata. Note rows of white tufts of bristles. They are flared out as a defensive response. Feeding behavior is one of the more interesting aspects of keeping these animals. Measuring the diameter of the worm and squaring that number makes an estimate for the size of the food item that they can take. The worm will swallow the piece whole. A specialized head appendage, called the caruncle, is used to locate food. The worms will become very active and start searching once food is introduced to the tank. They have to come into direct contact with the food item before they will begin their feeding action. Sometimes they will crawl by a piece of food that is one inch from their head in their frantic search. For this reason, it is probably best to stick-feed them if they are in a large tank so there is no uneaten food remaining. Sometimes they will crawl up the back of the tank and stretch out so that their mouth is along the surface of the water. By dropping a piece of food directly onto the searching mouth, it is possible to get an up-close look at how their mouthfunctions. In addition to being easy to feed, they are quite tolerant of water quality as well. I have not found them to be demanding with any respect to water parameters. A salinity of 35 (or SG 1.026) is good for them as it is most marine invertebrates. Temperature should be between 70F and 82F, although they can probably tolerate extremes on both ends. They do seem to be delicate when acclimating them after being shipped overnight. This usually induces a severe spawning response that sometimes leads to the death of the animals. Fireworms spawn by releasing games through ruptures in their cuticle. Often this response is so great when acclimating them into new water that the ruptures can sever the worms into pieces. Although some of the pieces may heal and regenerate, they are quite small compared to the original worm. I have not pinpointed what parameter change causes this, but it is interesting to note that they are able to withstand 75% water changes without the problems associated withacclimation post-transport. Perhaps it is the pH increase associated with acclimation after being transported in water where the pH declines. Fireworms do spawn on occasion in the display. It is a good idea to have a protein skimmer to remove the cloudiness as a result of the waterborne gametes. Be sure not to have micro bubbles entering the tank though. Any bubbles that are small enough to remain suspended in the water can become lodged in the tufts of bristles that span the worms. Although this is not a problem temporarily, it may cause stress if they are exposed long term. Any irritation to the worm, whether it’s from bubbles or any other kind of physical disturbance, will result in spines being released. These will drift around in the water for some time. It is a good idea to wear full-arm gloves when working in a tank with a large number of fireworms as even free-floating spines can cause envenomation. You do not have to contact the worm directly to experience its defense. Any direct contact should be made with forceps or another utensil. If you do happen to become exposed to fireworm spines, Nellis (1997) recommends that the spines be removed by applying adhesive tape on the wound and then removing it. Rubbing alcohol my help alleviate some of the pain. Remember, these worms don’t just deserve respect, they command it. Ciereszko, L.S. and Karns, T. K. B., 1973. Comparative biochemistry of reef coelenterates. In, Biology and geology of coral reefs, Vol. II, Biology, 1, edited by O.A. Jones and R. Endean, Academic Press, New York, pp 183-203. Harvell, C.D. and Suchanek, T.H., 1987. Partial predation on tropical gorgonians by Cyphoma gibbosum (Gastropoda). Mar. Ecol. Prog. Ser., Vol. 19: 181-187. Lewis, John B. and Crooks, Richard E., 1996. Foraging cycles of the amphinomid polychaete Hermodicecarunculata preying on the hydrozoan Millepora complanata. Bull. Mar. Sci., Vol. 58(3): 853-856. Lizama, J. and Blanquet, R.S., 1975. Predation on sea anemones by the amphinomid polychaete Hermodice carunculata. Bull. Mar. Sci., Vol. 25: 443-443. Marsden, J.R., 1962. 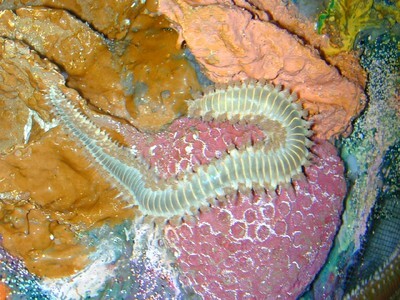 A coral eating polychaete. Nature ( London ), Vol. 199, p. 598. Nellis, David W., 1997. Poisonous Plants and Animals of Florida and the Caribbean. Pineapple Press Inc. Sarasota. pp. 259. Tursch, B., J.C. Braekman, D. Daloze and M. Kaisin, 1978. Terpenoids from coelenterates. In, Marine natural products, chemicals and biological perspectives. Vol. II, P. J. Scheuer ed., Academic Press, New York, pp. 247-296. Vreeland, H.V. and Lasker, H.R., 1989. Selective feeding of the polychaete Hermodice carunculata Pallas on Caribbean gorgonians. J. Exp. Mar. Biol. Ecol., Vol. 129: 265-277. Witman, Jon D., 1988. Effects of predation by the fireworm Hermodice carunculata on milleporid hydrocorals. Bull. Mar. Sci., Vol. 42(3): 446-458.